Ok, I'm having a little jetlag right now...after travelling for 28 hours back from U.S.A!! Not really in a mood to blog but I need to do something in order to make myself tired and sleepy. Been picking the window seats since flying from PG-SG-HK-SF, and then back from SF-HK-SG-PG. Due to long hours of travelling and weather change and insufficient sleep, I look like a zombie now... /("^")\ That's why I show only the side view of my face.. If you're wondering why I've been missing in action for a week, this is the reason -- yes, going somewhere that I've always wanted to go! There I was at PLL San Jose's headquarters..
During the short stay, I found a meaningful little pressie for myself. 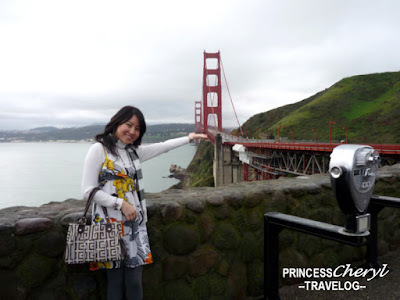 San Francisco Princess -- isn't it cute?? Hmm...now typing seems to work (make my eyes tired) quite well to overcome my jetlag.. Great, shall just continue with another few lines then I'm done. California dreaming....of blue sky. Now I really miss the blue, will be missing the sky which is decorated with huge white cotton candy. Never seen such a beautiful one until I go to San Francisco.